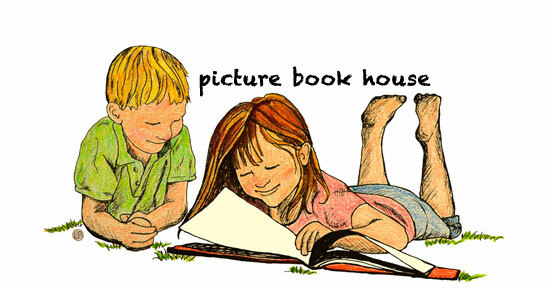 The other night a friend reached out to talk about picture books. Next year she will leave her middle school classroom for an elementary library. I wrote to her: “I’m jealous!” and then we went back and forth a bit about where to find lists of good picture books online. The two places I spend most of my time are the blog Seven Impossible Things Before Breakfast and Kirkus.com, where I search for the starred picture book reviews, read them, and then usually go to Amazon to see if I can “Look Inside,” the book. My daughter is on her way to reading independently, so we have spent a lot of time in easy readers/leveled books lately (I’ll post about which ones we love here, soon). And over lunch a few weeks ago we decided that our picture book collection was beginning to feel stale. I’ve been too preoccupied with spring garden chores and moving to spend much time scouting out new picture books on the sites I love. So, the e-mail from the future elementary librarian last week was the impetus I needed to find out just what picture books are getting starred reviews these days. To make up for the three-month picture book buying draught I bought seven of them in one swift click. One of them has instantly claimed a place on the Picture Book House shelf of fame. 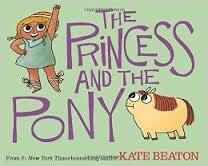 The Princes and The Pony, by Kate Beaton (Arthur A. Levine Books, 2015) is hilarious. It’s got it all: a birthday, warriors, weapons, fighting and even farting. Alas, even though “…they tried their hardest…” the pony Princess Pinecone’s parents procure is anything but big, fast or strong. “HA HA HA HA HA!” I laugh out loud when I do turn the page (even for the fourth time that day we have read the book). “It’s not that hilarious, Mom,” my five-year-old says with a sideways “…you’re losing it” look. “Oh. HA HA HA! Yes it is!” I guffaw back. Her response is because she is embarrassed by my behavior, not because she really thinks it isn’t hilarious. Beucase she does. My kids laugh/cringe at my ridiculousness. But back to the final spread. Oh, I do want to write it out here…BUT, I would be stealing the pure joy you will get from reading it out loud to your kids once you have a copy of the book. And do read it out loud. I was reminded yesterday, when this arrived by mail during nap and I read it to myself first, and then out loud to them once they woke up, how much BETTER picture books are when read aloud. The “Awwww” for example didn’t come to life until I was performing it for my kids. I’ll just say there is a toot, a perfectly timed, perfectly illustrated toot, that as an end cap to this perfectly written and illustrated book already has us coming back to it again, and again, and again. So happy to see you writing here again, and so happy for our librarian friend!